Hi All. Hope everyone is well and enjoying the sunny but colds day we have has of late, giving us a last chance to get our cars out before bedding down for the winter. Our next club night , Ian Jones has arranged for us a talk & photographic show to given by Alan Cox, a Motor sports Photographer, Racing at Oulton Park & some Grands Prix from the 80s , with a few Midget & Sprites, he will all so provide commentary. So if we could start our meeting that night at the slightly earlier time of 7-30pm , as we have a few things to talk about and I would like to start Alans talk about 8pm. Then we may also have time later for any chat that members would like to have. I will remind you again just before the meeting , but if you could make a note in your diary of this start time . Thanks. Hi For all those booked to do the Halloween Run on Sunday 28th October. On arriving at Park Hall Hotel around 10-30am, proceed to rear of the hotel passing the Lake on your right to car park 4, after parking up walk though the rear court yard into the hotel lounge , where you can purchase Tea or Coffee & Biscuits for £1-95 per cup. We will have copy’s of the menu for the end of day late Lunch stop ( The Farmers Arms ) so you can select your choice, which we will deliver to them before the run , so helping them with service on our arrival around 3-30pm, They have asked, If we take seat in the reserved area, their staff will take our drinks order and deliver to the table. The Farmers Arms @ Heskin. that we are stopping at for the late lunch after the Halloween Run. Some of you have said you have had a problem with seeing the menu. The pub has recently changed hands and the website is being changed and menu is not on there as yet . We are intalks with the new landlady and all is well , we might even give our food order in just before we leave on the run, as the pub is very near to Park Hall Hotel. Hope that make things clear, as thing change we will keep you informed. Hi Bernie has asked me to send out the below message to all members of the North West Area. Some of you will already have received an email regarding a repeat of this year’s trip to The Circuit Des Remparts race weekend at Angouléme, incorporating stopping off at various other attractions along the way there and on the way back. I sent out the email to those who had been this year, and to others who expressed an interest at the October meeting, not thinking that there may be others who were not aware of the event, but would like to come. So here are some loose details. First. You don’t have to be in a Spridget. You are welcome in whatever vehicle you choose. Next. The dates are 5th September to 19th September 2019. If you want to go, the most important thing is to book the Angouléme hotel ASAP, because due to the popularity of the event, the hotel fills up quite quickly. The preferred hotel, which some of us have already booked, is, Campanile Angouléme Ouest-Saint-Yrieix. and you need to book as follows: Check in 12th September. Check out 16th September. There are other budget hotels in Angouléme if the Campanile is full, and, although we can still meet up on the relevant days, it would be nice if we could all be in the same hotel. The rest of the trip, at the moment is still a bit loose, but will probably involve a couple of car related museums and maybe the odd château or two. The race weekend is of course the main attraction, but everyone is free to do whatever takes their fancy before and after that. You don’t need to feel that you have to do what everyone else is doing. Anyway, that’s it so far. If you want any more information, please contact me at b.higg41@gmail.com or on 07905 412265 any time. Central MASC Monthly meeting October 3rd 8pm onwards. Due to work commitments I may be late or unable to attend this months monthly meeting, so, please as usual, make use of the cordoned off area to the left of the bar who ever arrives first. I’ll be attending the MASC A.G.M. at Gaydon this Saturday 6th. If you would like to join me for the drive there or have any questions you would like me to ask just let me know. I’ll (weather permitting) also be attending the last Middleton Hall (B78 2AE) meeting of the year on Sunday October 7th,10am onwards. 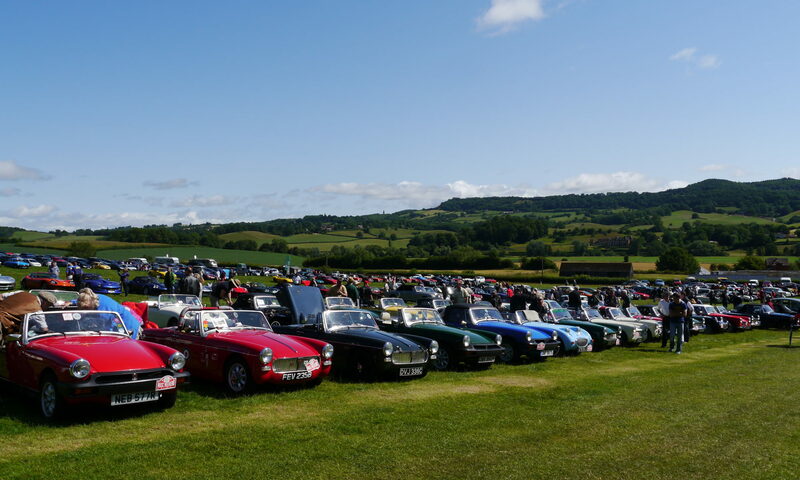 I know Greg and Anita are meeting up with members from Notts/Derby group to travel to the Hall’s Garage 70th event on October 13th in Bourne, Lincolnshire, maybe one to discuss at the monthly meeting if you would also like to go or contact me via e-mail to show your interest.